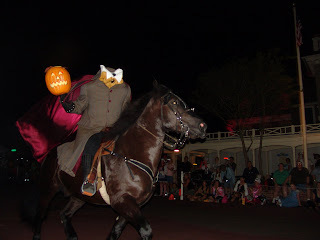 Here is a picture of the Headless Horseman who starts the Halloween Parade in Disney. kevin closed the pool tonight so I guess summer is truly over. I am ready for some cool weather. I am ready for jeans and sweatshirts. I want to see pretty colored leaves....FALL where are you? I went to the gym today but I only walked on the treadmill for 20 minutes, I am getting a chest cold and it just wasn't easy to breathe. I am going to go again tomorrow and hope for better results, I don't want to put it off another week so I will suffer through and hopefully sweat out this cold. Ryan is doing well in school and has gotten 100s on all his spelling test so far. Nick just got back from Disney so they played all afternoon together. They are both glad to be back and playing again. I have everything unpacked and put away, I am still working on the laundry. Of course laundry is a never ending job. Well that is all girls, just thought I'd catch you up on our lives. CHOW! and GOOOOOOOO RYAN!!!! u speel thosse werds gud! maybe u can tutor me? I love the headless horseman...he's handsome. Sonya~he sees with his seeing eye horse. Oh Carrie that was good!! Sorry Amanda is not that you weren't invited we didn't have any, it was a busy summer. Next summer you're all invited!! We are supposed to be at 60 degrees the rest of this week so you should be happy for a few days.I`m not a cold weather person but 60 degrees isn`t bad. I do love my sweatshirts, though. Time to post now Cheryl Ann! I too am ready for some cool weather - but after today, NOT this cool! I do enjoy fall and the leaves. I hope your cold is better now. YEAH! Way to go Ryan!! Laundry is a never ending job - you are SO right!